One benefit of be unexpectedly sidelined from New Year’s Eve partying is not waking up with a hangover in the morning. No hangover meant that I had no problem putting effort into making a yummy and healthy breakfast to ring in 2012. 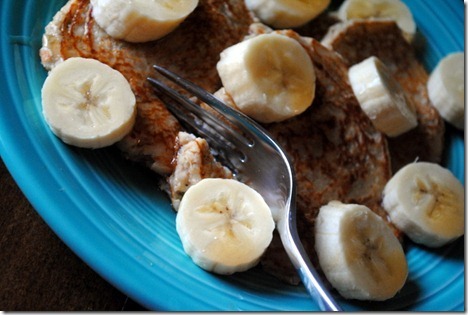 After topping the pancakes with a sliced banana and syrup, it was time to eat! Definitely a yummy way to start the day. I actually have a pretty bad case of the sniffles and feel all-around crappy and lethargic today. I really, really hope I’m not getting sick! I’m taking all of my vitamins and drinking lots of fluids to help ward of any impeding sickness. Booya! Other than attending church, today has been spent at home with Ryan and Sadie. 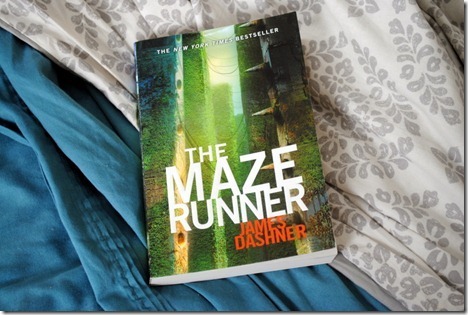 Ryan and I started reading The Maze Runner together a few days ago and are hooked! I actually bought the book for us to read together months ago based off of a recommendation I received from Michelle who swore I’d love it since I seem to find dystopian novels compelling. She was right. It’s gripping! I think we may finish it today and I highly recommend it to any of you out there who loved The Hunger Games series or Divergent. Other plans for the day include cooking up a New Year’s Day feast with Ryan, including all of the typical New Year’s Day foods! Have you ever had a traditional New Year’s Day meal? What are your “must haves” for a New Year’s Day dinner? On our menu: Black-eyed peas, collared greens, ham and sauerkraut! Chobani is magical. Literally just made of fairy dust. Happy new year, Julie! I stayed home for the first time this year too! I also woke up with sniffles and feel very tired… Hmmm, not fun. My whole life my mom makes lasagna and salad for new years day and black eyed peas on new years eve. I am keeping the tradition and making up a turkey sausage and spinach lasagna along with a blueberry trifle! I also started the new year out with protein pancakes! So delicious! I was driving back home and only reached at 11.30 so my New Year dinner involved a yogurt mess…time to hit the sack now! I had no idea there was any sort of particular thing you were supposed to eat on New Year’s Day either. But I’m seeing a ton about it on blogs today. Happy new year! Chobani is the best – today I bought apple cinnamon chobani and I cannot wait to try it! New Years Dinner means we must have some form of green vegetable and ALWAYS black eyed peas! You can’t get injured and sick!! Hope you feel better! Hey-o! I’m sniffly too! Happy new year to us! Haha. I’m also madly in love with dystopian fiction cause I’m weird like that. The Hunger Games is on my list and I’ll have to add this one, too! Maybe it’s the moon or something in the earth’s balance (haha)… yesterday I totally wiped out on a typical morning run and the week prior I fell on a rocky hike. Bruises and bangs aching in the new year! My family always had “Hoppin John” for New Years Day. It’s the funny name of the standard luck-bringing black eyed pea, collard green meal. We’d always have cornbread, too. Southern deliciousness. Hope your hand is feeling better, Julie! my family’s traditional meal is pork, sauerkraut, mashed potatoes, and applesauce. Pork is supposed to bring you good luck, I guess? Happy New Year! 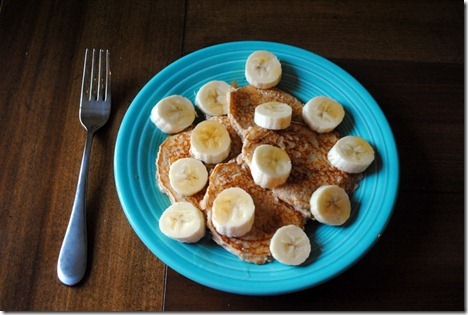 Greek yogurt pancakes sounds great and so full of protein! My mom just got a food processor… And I think you might have just made my breakfast for tomorrow. And I think you’re onto something with the flavored chobanis! I wonder if the ones with fruit would work…. I LOVE starting the New Year off without a hangover! Although, I do have a bit of a sugar hangover today from all the ice cream I had last night…lol. I’ve never tried yogurt in my pancakes. What a great way to get in more protein. We don’t ususally do a traditional New Years dinner because my hubby doesn’t love black eyed peas or cabbage. I hope you have a Happy New Year! your pancakes look delicious and sound so easy to make! i need to try those. we’ve never really had a traditional new year’s day dinner. in fact, i didn’t even know what a “traditional” new year’s day dinner looked like until you mentioned what you guys were having. 😉 i think it’s a great idea though. we’re being lazy this afternoon and then some thai food is on the menu for this evening’s dinner! Been reading your blog for a while now. 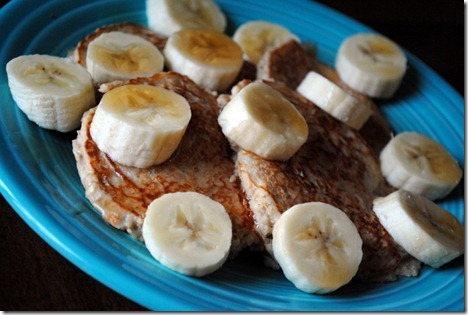 Love the pancake idea! Also, I love that you include the ingredients in your food! So many people post pics of their food, but don’t tell what is in them! I need all the help I can get! I have heard of that book. Now that I am getting ANOTHER recommendation for it, I am definitely going to have to read it! Ohhmygosh. Another booboo Julie ….. geewiz. How are you today? All of us sisters have had similar accidents. Past tense ….. thankfully. I am super-duper careful. Really. Have been for lotsa years. Totally dislike ER’s. Ugh. Avacados almost cripled us. An orange and onion too. I am wise to them now. All fruits and veggies. Believe me. Our youngest sister ….. well, nevermind. I absolutely loved that you stayed home in your cozy pj’s w/your delightful family! Sadie is precious. Ryan too! HA. Please. Take care of yourself Julie. We don’t really eat any special food on new years. Actually, we probably usually end up ordering pizza because we’re so tired from the new years eve! YUM!! Those pancakes look amazing!! I went on a 9 mile walk to kick off the New Years. I am walking a half marathon after not being able to run as I am going to be 7 months pregnant at the time of the race! Ho[e your finger is feeling better! That glue is amzaing!! Yikes on the sliced finger! Hope it heals quickly. So glad you are enjoying the book! We don’t have any traditional New Year’s Day meals – but we do eat Chinese takeout every NYE. My family has never done the traditional new years meal, I didn’t even hear of that until high school! I’d love to do it each year though, I like things like that! 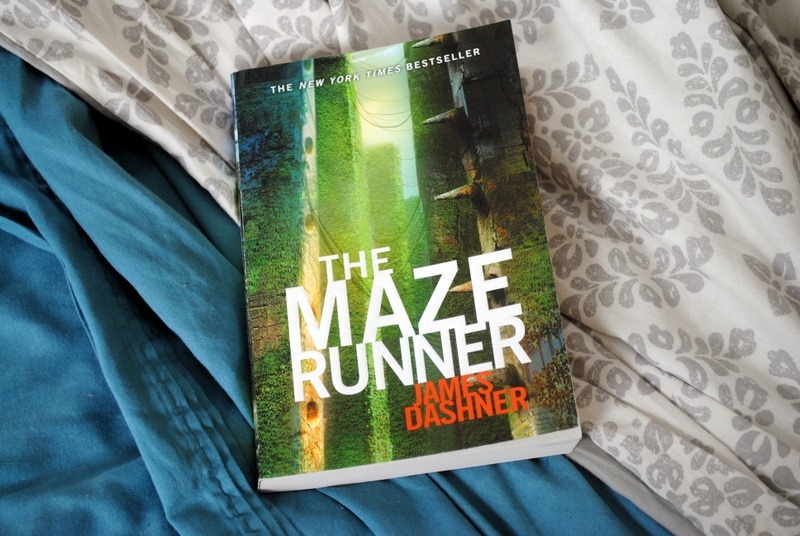 Keep us filled in on how you like The Maze Runner! I told my (eighth grade) students that I loved the Hunger Games and asked for recommendations, and they all said to read Maze Runner. I may have to read that one too! I loved The Hunger Games and I can’t wait to start Divergent. I hope your finger is healing nicely. Happy New Year! We do blackeyed peas, cabbage, and pork. Yummy! I actually like new year’s food better than Christmas food. 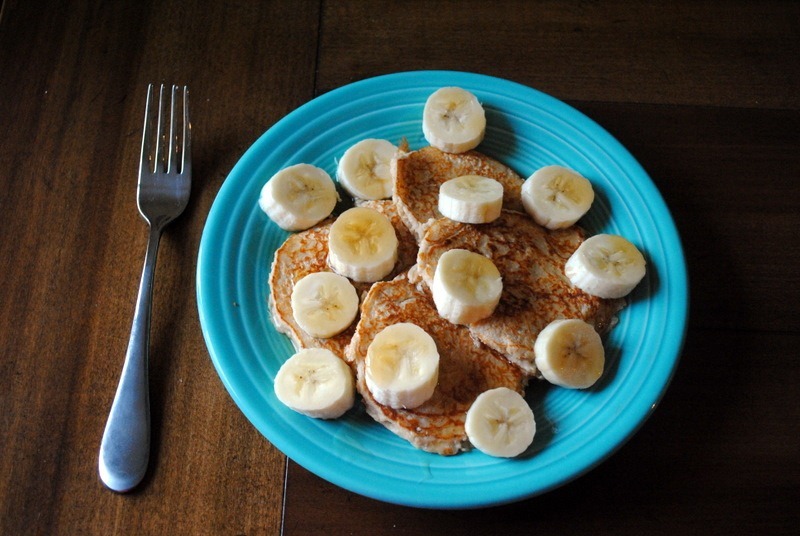 I really need to try making pancakes using Greek yogurt [not just putting it on top]- I tried a few weeks ago and it was a complete flop [I subbed the Greek yogurt for the eggs]… Did you add any baking powder? I wish we had Chobani here in the UK! Did you hear the sequel to Divergent is out!! I squealed in Barnes & Nobel over the weekend! It’s called Insurgent. i had no idea!!! that’s great news! thanks, laura! These are so good! I like to cook my banana slices in the pan so they caramelize and get even sweeter 🙂 just sauté them with a little Pam! Sorry, late to the party..but I wanted to make these. Did you use and baking powder to make them lighter? Thanks! i didn’t, but i love that idea! Just tried these pancakes out! They were soooo good! I used vanilla Chobani. I also put some peanut butter on mine with bananas 🙂 great greek yogurt protein pancake recipe!! OMG!!!!!!! These are FABULOUS!!!!!!!!!!! I LOVE them! Easy,healthy, and only 3 ingredients! I have just discovered your site and this is the first recipe I have tried, and it is a winner! I can’t wait to try more! I made them for my 12 year old son, and he loved them. He worries because I try to cook healthy and he worries about taste. He makes me laugh, he says, “Wow Mom, you make healthy food taste GOOD!”, and THAT is all I need to here to know when a recipe is a keeper. Needless to say, this IS one of those! Thanks! and keep up the GREAT work! Awesome!! !